Well, the truth is that I play all sorts of miniature games. 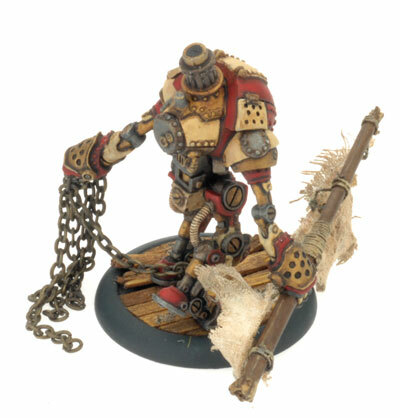 I'm a big fan of small skirmish-sized games like Warmachine and Malifaux. I've also got into Dystopian Wars in a small way (done some painting, but no games yet). 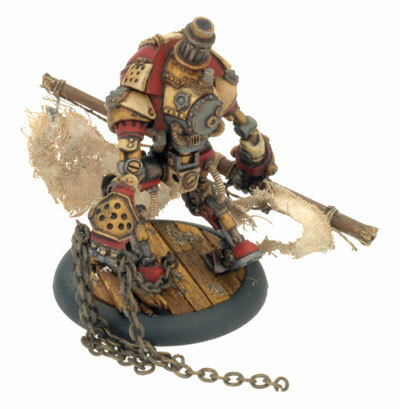 But recent excitement among friends has been focused (no pun intended) on Warmachine. I've got both Cryx (undead) and Pirate mercenaries. My Cryx collection is pretty limited so I thought revisit my Pirates instead because I've got a lot more of that, giving me more flexibility in games. This weekend I've been doing some repainting and touch ups (these were among my first 28mm models, after Confrontation). While my camera skills are lacking and I'll have to wait until next week to borrow a better camera and a light table, I thought I'd post up some pictures of some of my older models to get you caught up on my Pirates. First off is Shae, my warcaster. For those of you who might be unfamiliar with WM, a warcaster is the general of your army. He possesses archane abilities which allow him to control warjacks, large steam-powered robots. Shae is a tidy pirate, meaning he keeps up appearances. So I've given him a jacket based on 19th Century British Royal Navy colors. The rest of the army's color scheme is loosely based on Shae's. Beyond Shae I've got a motley collection of dubious pyrates. This one is from a press ganger unit, which can club enemy troops over the head and recruit them to join your sea swabs. I like this unit a lot for its humor, and I'll be touching these guys up soon so hopefully I'll have some more pictures for you to look at. Thanks to some friends back stateside, I've given all of these figures planking bases to represent them fighting on or near a ship. I've got plans to eventually make a 4'x 4' seaside port table just for my Pyrates. I've been collecting all the pieces and soon I'll start working on that massive project! Next up is the Marine. I've a substantial amount of modification work on this model. 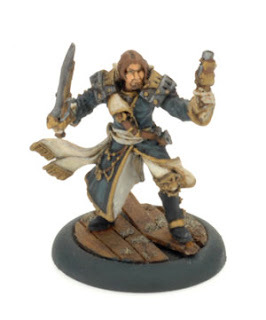 One disadvantage of Privateer Press (makers of WM) is that they usually don't offer variant models, and if they do its for all of the other major factions, as I'm not aware of a good alteration kit for this model. 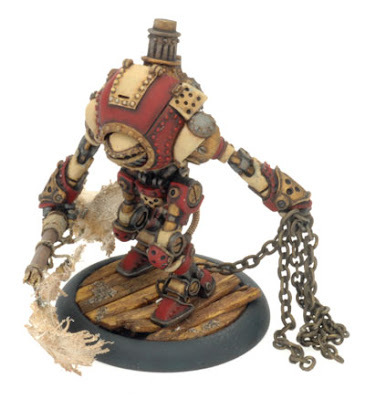 Anyway, the Marine is a Buccaneer Light Warjack. Its realitively light and is therefore cheap in terms of points. So you can have a few in your army if you want. 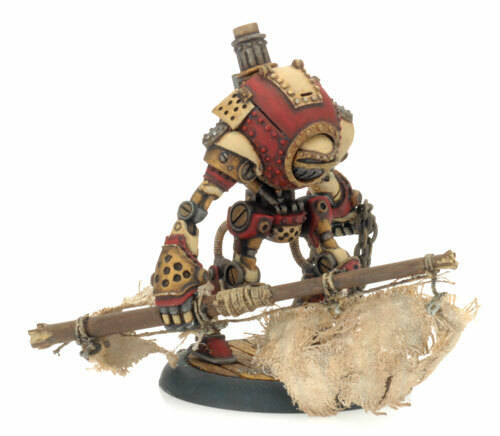 I really like this warjack as it has a lot of character and really looks like the sort of warjack that would be found on a ship. Here (left) is the original Privateer Press model so that you can compare. I've got another Buccaneer besides the Marine that I've pained up without any modifications, called Union 'Jack (he's got a British jack painted on the side). 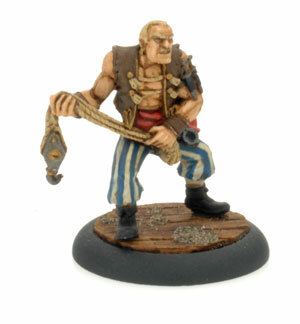 As you can see, the Buc is armed with a Gaff weapon and holds a net in his left arm. In the game he can toss this net to bind the target and then smack him with the gaff or let someone else have a crack. I really like the concept of the model, but there is at least one aspect I really don't like. The net does not look natural at all and I find this very distracting. Granted that sculpting a realistic net might be a difficult task, but this is seriously a horrible attempt. So that had to go on my second Buc. Second, I didn't want the Marine to look identical to Union 'Jack due to the overpowering nature of the gaff. While this works well for Union 'Jack, I don't want it on all of my Bucs, so like with the net I had to think of what else to give the Marine that would perform the same function. Finally, the color scheme had to be different to give the second Buc its unique flavor. I went to my books and had a look at 19th Century uniforms and found the Royal Marines'red coats interesting. So that's how this Buc got his name and color. Furthermore it also gave me the answers to the weapons I should give him. Marines spent the duration of a naval battle in the crows nests and masts shooting down onto the decks of the enemy ship. Therefore the Marine's weapon would be a chunk of mast with torn sails. His 'net' would be a handful of heavy chain he presumably picked up when he boarded the enemy ship. Sorted! Anyway, that's all I have a the moment. I hope to have more WM pics up soon! Thanks for stopping by! Hey glad to see that you are going back to the pirates and giving some love, I really love that conversion on the light jack, I cant wait to see an army shot when you finished the lot of em! Hey, Mike. Great conversion! What paints did you use for that Buccaneer? Thanks! I used Vallejo's Flat Red and Buff, highlighting and shading where necessary. Metalics are all GW paints.